This spaghetti strap 100% polyester dress is a vintage Napoli. 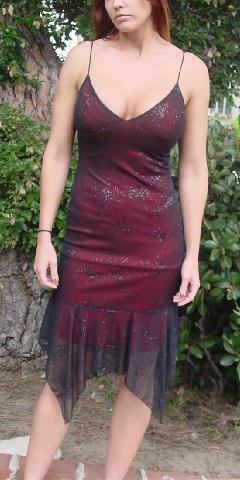 It has a red somewhat stretchable lining with a see-through black fine net dress with an iridescent black glitter freeform design pattern. There is a 7" deep V neckline. 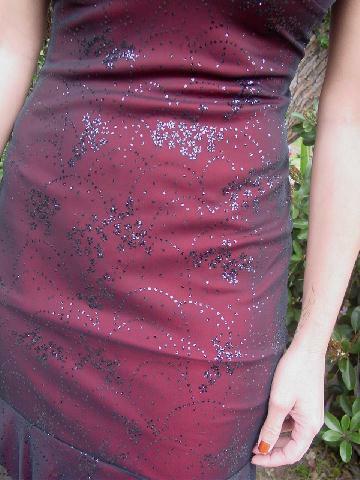 The bottom hem has a scarf effect. The top back has a thin elastic panel. The tag says M, but it fits more like a size 6. It's from a Miami model who wore it to a club opening. shoulder to bottom hem (shortest) 38 1/2"
shoulder to bottom hem (longest) 48"
armpit to hem (lining) 28 1/2"